What is DXL File: DXL files are generated by the Lotus Domino software. It is an enterprise-level business application. DXL files stores the different data items such as Emails, calendars, Contacts etc. Only IBM Lotus Notes can open .dxl file. Sometimes, there may be a situation when a user needs to view his emails and at that time, one becomes unable to access Lotus Notes email client. In this situation, a user needs a DXL File Viewer to open and read DXL file(s). 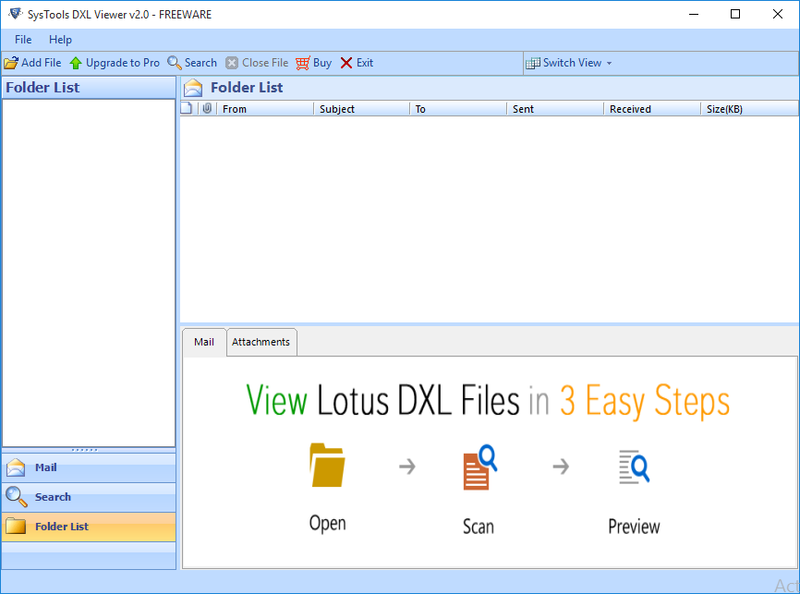 DXL Reader enables a user to view all the DXL files without installing Lotus Notes. 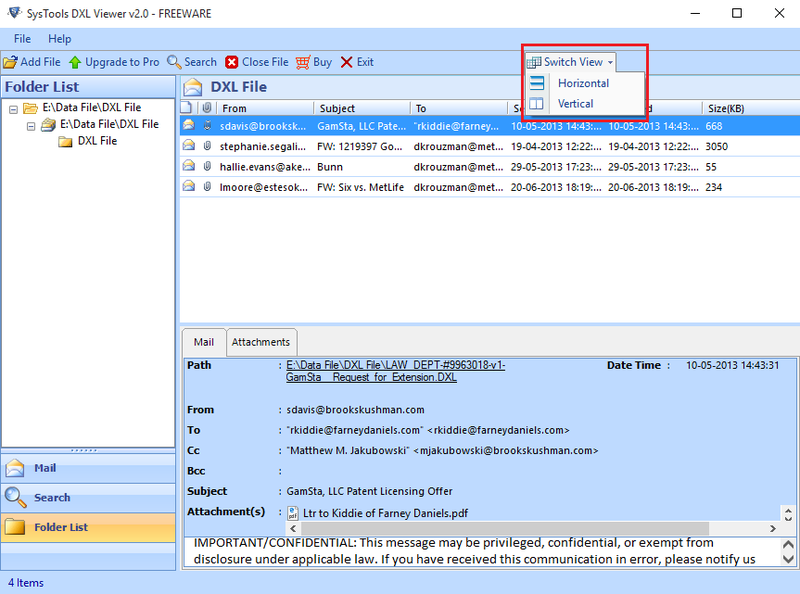 DXL File Viewer provides allows a user to open and view data from DXL file(s). This tool also shows the preview of all the attachments along with emails with its attributes like images, extensions, documents, To, From, Cc, Subject, sent date, Received date etc. After running the software, it scans the entire system and shows all the DXL file(s) automatically. You can select file(s) or folder(s) by simply expanding them and add to load the file(s). It helps to find the exact location of the files. You can categorize or sort your emails according to your choice by properties of email such as Sender's email, Size in KB, Subject, Date, Receiving Date, Sent Date etc with the help of free DXL Viewer Tool. DXL Viewer is a great solution to open and read DXL emails along with attachments without installing Lotus Notes. This tool can perform on any machine with or without Lotus Notes and this feature makes it independent. Explain the working of DXL File Viewer Tool? Step 1: Install & run DXL Viewer application. Step 2: All the file(s) and folder(s) will appear on the left panel. You can select and add the DXL files. Step 3: After selecting the file, all the emails along with attachments will appear. You can view your emails using different view modes. Step 4: You can export the selected or all the emails as PDF file format using Pro Version. Can I install DXL Reader Tool on Windows 10 Operating system? Yes, DXL Viewer utility is compatible with Windows 10, Windows 8 and other below versions. Is Lotus Notes is necessary to install for viewing the DXL files? No, there is no need to install IBM Lotus Notes for viewing the file. Does DXL Viewer Tool have any size limitation to open and read bulky files? No, there is no such limitation on the file size in order to view or read any large file. I don't have much technical knowledge, Can I manage this application? Yes, this tool is easy to understand and use. It does not matter whether you are a technical or a non-technical person. "I used DXL File Viewer, the software is quite user-friendly and does not require any kind of technical skills. As, a non-technical person, I easily managed to view all the data items of DXL file on Windows platform. Thanks to the technical team for supporting and helping me!" 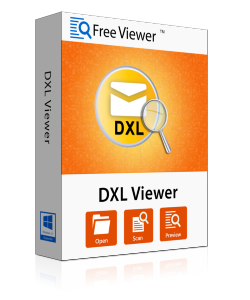 "The Free DXL Viewer did an excellent job since it doesn't require an installation of any other application such as Lotus Notes email client to open and read IBM Notes DXL files. With the help of this tool, I was able to complete my work on time. I must say that it is a Great tool!" "I had some DXL files in my system and I don't know the location of the file. DXL Reader tool was suggested by my friend to explore and add the correct DXL file. It provides an option to which I can simultaneously open and view data contents from the file. This tool really works for me!" "DXL File Viewer also opens old DXL files without installing any application such as Lotus Notes. Therefore, it is an independent application which provides multiple features in a single utility. Hats Off, FreeViewer for this amazing tool!"